Most of us weren’t fortunate enough to attend NAB this year, causing us to miss out on some insanely informative presentations and tutorials by leading industry artists. Luckily, everything is recorded and with partnership with Cineversity, the Dojo is able to feed you the awesome presentations in digestible chunks. In the few upcoming posts, you’ll be able to watch all the live Cinema 4D presentations from NAB in organized sections right here at the Dojo to easily get educated on specific topics. In this series of presentations, you’ll see project breakdowns of 3D projection mapping techniques from industry pros: Michael Rosen, Alan Demafiles, Steven Messing, & Craig Whitaker. Projection Mapping allows you to take video and give it an astounding sense of presence by projecting it onto three dimensional objects – be that a custom-built art object or the facade of Los Angeles City Hall for a New Year’s bash. Camera Mapping, or Camera Projection, is a technique that takes the same idea – projecting a 2D image onto a 3D surface – and applies it in a digital realm. Using a still photograph and simple 3D geometry, you can quickly create photorealistic shots. NAB 2015 Rewind – Michael Rosen: Project Breakdown of Titles for Microsoft’s Modern Workplace from Cineversity on Vimeo. Michael Rosen shows how he used Camera Mapping and MoGraph to transform simple photographs into a dramatic 25 second open for Project Breakdown of Titles for Microsoft’s Modern Workplace. NAB 2015 Rewind – Alan Demafiles: Animating Projections on Massive Structures with C4D from Cineversity on Vimeo. In Animating Projections on Massive Structures with C4D, Alan Demafiles shares a building projection, where a dragon breaks through a wall lighting it on fire using particle effects. NAB 2015 Rewind – Steven Messing: Hollywood Filmic Design Techniques with C4D and Octane from Cineversity on Vimeo. In Steven Messing’s Hollywood Filmic Design Techniques with C4D and Octane, he uses Camera Mapping to extend a set from HBO’s Boardwalk Empire. Shots from Exodus, Berkey City, Star Trek, & Life of Pi all show C4D camera mapping techniques put to good use. 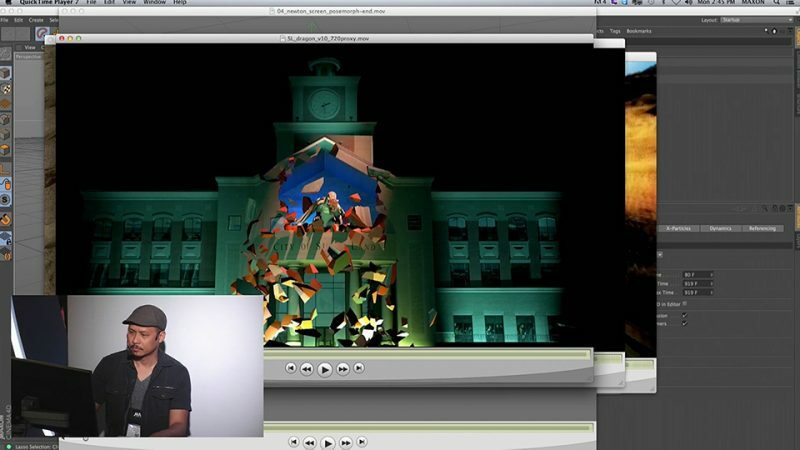 NAB 2015 Rewind – Craig Whitaker: Projection Mapping and the C4D/NUKE Pipeline from Cineversity on Vimeo. What can you do with a photo? Craig Whitaker answers the question with an overview of projection mapping in Cinema 4D and Nuke. You’ll learn about C4D camera mapping tool: Projection Man, and how simple modeling and deformers can both match the photo and add life to the scene. Thanks again to Maxon US and Cineversity.com, for recording and publishing the 2015 NAB Live Cinema 4D Presentations. They have also released a number of other great presentations, so stay tuned for more! In the meantime, enjoy all the content and get your learning game on.